Flight cancellation announcement all of a sudden can take away all the joy and fun, the things that immediately comes to the mind is how to either claim for cancelled flight or wait for the next alternative flight. If you are lucky enough, you will get the opportunity to sit and complete your journey in the next alternative flight. If you are stuck at Delhi’s airport, you might be wondering how to sit and wait for the next flight without torturing yourself. No matter if you are new to Delhi or has been there a lot of times, each time this city has a lot to offer, from delicious street food to shopping destinations, one can find all the fun in a single go. Who said you have to sit and watch the airport authorities all day long when you can actually go out and do a few exciting things for a memorable day. Here are the 10 amazing things you can do in Delhi without depleting yourself in a wait for your next flight. In order to facilitate your relaxation, head on to the Plaza Premium Lounge located at T1D. Rejuvenate your time with comfortable seats, hot served unlimited buffet, complimentary wifi, T.V, magazines and drinking options. You can get access to the lounge by either making a reservation or via an onward boarding pass. Calm down your anxiety and stress by visiting a spa in a meanwhile. Lay back and relax with the o2 spa at terminal 3. From head massage to western massage, you can find a variety of options offered by this place. Packing and rushing towards the airport can be very tiring, especially when the flight timings are very undesirable. It is always good to hold yourself and complete that sound sleep. You can catch up with your precious sleep at Snooze at My place which offers sleeping pods to the passengers on an hourly basis. If you are visiting someone, this time is perfect to buy a gift or token of love for them. You can use this waiting time at the airport to buy souvenirs or some gift item for the family and friends. Stores like Happily Unmarried and Ferns N Petals are there near terminal 3 that offers a lot of articles to purchase. It can be quite daunting to wait until next flight. If you are a huge lover of brands, lost yourself into the stores like Tommy Hilfiger, Shopper’s stop, Gini and Jony located at terminal 3. Gorge yourself into the branded stuff and learn what new trending options are there to purchase. You might be going for some business meet or maybe a short break. Plug your laptop and finish off the pending task. Use this time to hold on to the pending office work or maybe some presentation. You can even plan ahead for your work. If you are a huge fan of archaeological places then you definitely need to save time and visit Mehrauli Archaeological Park. Roam here and adore its beauty, read out its history and return back from there with some soothing memories. 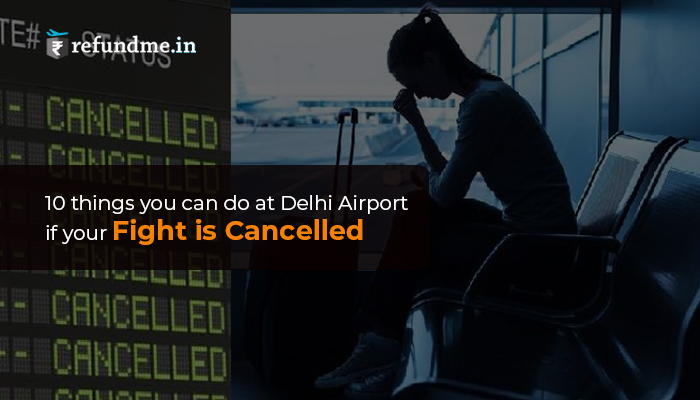 Do not spoil your time by wondering about your cancelled flight or how you can claim for cancelled flight compensation. No matter if you are travelling alone or with a bunch of friends, cheer your mood with a few chilled drinks and snacks at Cafe Delhi Heights at T1D. If it is hard to decide which place to go then visit Ambience Mall located at National Highway 48. You will find ample recreational activities there from bowling to go-karting. You can even spend your time in serenity there shopping or munching food. If you are a huge fan of open places with greenery and colours along with quality time then try Hauz Khaz village which is located at South Delhi. There you will find ample options for food to archaeological beauty. If good music and good food is your gig then definitely consume your time with this place. Cancelled flights are depressing and thinking of getting its cancelled flight compensation is even more depressing. It is no more depressing since with refundme.in you an assure your flight cancellation compensation in India timely.